We are taking Spot UV to the next level (literally) with our brand new Scodix business cards! 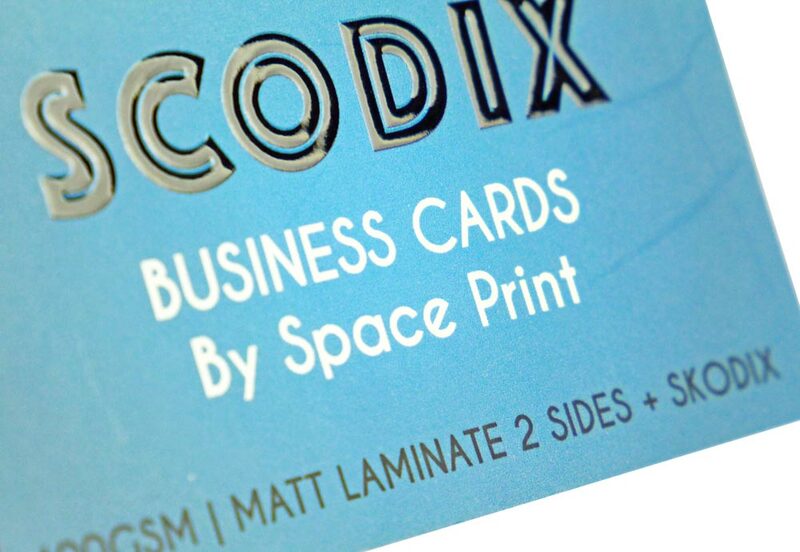 The Scodix process adds a raised, 3D effect to your business cards. 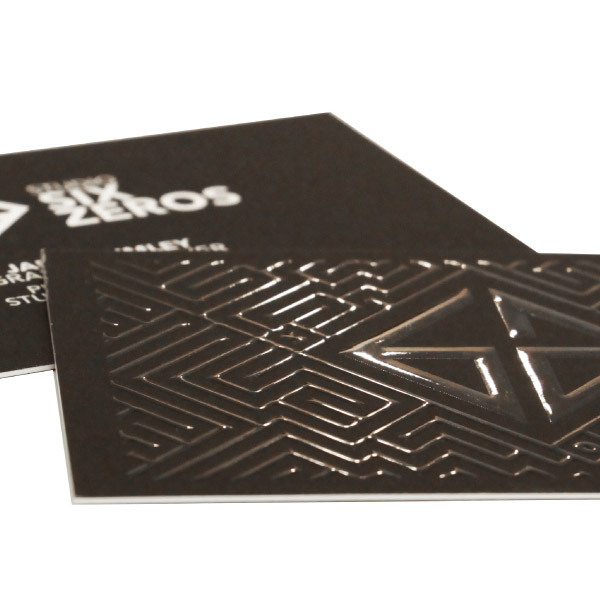 This can be applied to anywhere on the card so you can use it to highlight your logo, text, graphics or even create a pattern on the background. The creative possibilities are limitless! Scodix can be applied to one or two sides of the cards! Printed on heavy 450GSM Velvet stock, these luxurious cards have a coat that gives the look of matt cello glaze while adding a texture that feels like silky velvet and has the highlighting effect of Spot UV but raised! We print Scodix business cards twice a week with runs on Wednesday and Friday! Creating your own artwork or your designer asking for how to supply the files? Details below on what we require to get you the best results! Include 3mm bleed – For more information on artwork bleed click here. For best results do not place any text or logos within 3mm of the edge of the artwork. To setup the Scodix Area – Create a seperate page or pdf that only includes where the Scodix is to be applied and set the colour to black. Got the skills to design your own cards? Use the free templates below! Each kit includes templates for Adobe Illustrator & InDesign as well as instructions for how to use each file. Templates are already setup with guidelines showing artwork size, internal margins and minimum bleed. Cant see what you need? Fill in the details below and we will be in touch very quickly! Great service, super super quick and great communication! Will use again! Superb service - fast, easy and fantastic quality. Highly recommended and would definitely return! Great customer service, speedy delivery and fantastic finished product! Amazing quality! Will be using again in the future � Business cards were always packed very securely. Insane quality for the price, super easy to deal with too. Easy to order business cards online, great service, well priced, cards arrived promptly, looked perfect and felt even better. I have executive clients who responded really well to the business card's quality. I couldn't recommend SPACEPRINT enough!! Space Print are wonderfully helpful and fast. They printed and delivered some print materials I designed to a client within three days. Highly recommend them! Excellent customer services and excellent product. Reasonable price and promt delivery services. I would recomend Space Print services to anyone who is after good quality budiness cards. Keep up the good work Space Print and you will have all Australian businesses knocking on your door! Good work! Thank you for your fast service 😄 10/10 recommend for business cards. All your staff are super friendly and helpful as well! James was great to deal with, he was very patient and helpful throughout the design process, and the final product turned out beautifully! We always get asked where we got our business cards from and of course we refer them to Space Print. Thanks again. Great service at a great price. Highly recommend! Spaceprint were fantastic with professional and fast service. 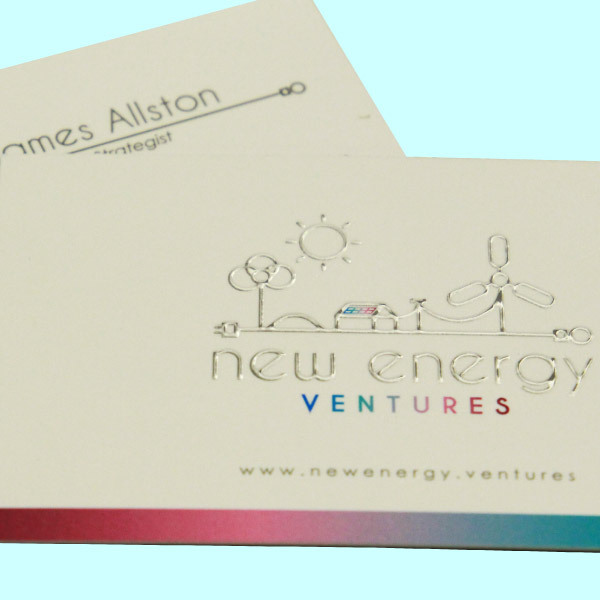 With a really tight deadline from design to print they were able to suggest options to get the job done quickly and they had our business cards and flyers produced and in our hands a day earlier than expected, ready for our Trade Show. They understand business owners and the communication throughout was excellent. Highly Recommended. I have used SpacePrint three times for business card printing for my small business Clean White Bear. I choose to use SpacePrint because they have a clear easy to navigate web site, intelligent advice over the phone, they are technically good with a high quality product, excellent pricing and great communication. Easy to use, exceptional service and great quality print. Really happy with Space Print. Always on point. Thanks for the awesome service. Excellent customer services, great quality print... I couldn't fault these guys one bit. I will be getting more printing done with them for sure. Great service, I was able to get a hold of someone at 9pm on a Saturday, very quick with sorting my designs out and delivery was just as quick, will definitely be using again in the future! Cheval is a pleasure to work with. The premium velvet business cards were superb. Although a small portion of the batch had a printing issue, Cheval rectified it immediately. Great customer service. I am looking forward to getting further print jobs done at Space Print! Very happy with the finished product- great quality printers! After requesting business card samples through the Spaceprint website, Cheval followed up with an email letting me know they would arrive in the mail within a few days and if I required help ordering, to contact him. During the ordering process, I wanted to see proofs before paying, so I clicked pay later by invoice. Cheval sent a proof by email before printing and back and forth a few times until I was happy with the final product. Business cards arrived and the delivered package from Spaceprint was professionally packed and cards as expected, so I will use this service again! Thanks guys! Spaceprint were fantastic to deal with. Very accommodating with the design. Clients love the look of my business cards. Thank you for such suburb quality cards. Just got the business cards. Wow! Thank you so much. Really happy with them and blown away with turnaround times. Thanks again for helping with the proof and everything else. Will definitely hit you guys up again in the future. Received excellent service, a great product and all at a very discounted price. Will use them exclusively from now on. A leading, environmentally friendly printing company located in Australia. We have printing facilities in Melbourne, Sydney, Brisbane and Perth which allows us to quickly service our clients nationwide. To find out more call 1300 344 778. Superb service – fast, easy and fantastic quality. Highly recommended and would definitely return! Easy to order business cards online, great service, well priced, cards arrived promptly, looked perfect and felt even better. I have executive clients who responded really well to the business card’s quality. I couldn’t recommend SPACEPRINT enough!! Excellent customer services, great quality print… I couldn’t fault these guys one bit. I will be getting more printing done with them for sure. Copyright 2019 © Space Print | Website Design By Space Digital.